Set in France, it follows its lead, Sam, played by Robert De Niro. He's a former CIA agent hired by Irish terrorists to work with a group of mercenaries in order to steal a briefcase before it's sold on the black market to the Russian mafia. Despite asking numerous times, Sam's never told what's enclosed, nor are we. He's joined by Jean Reno, Natascha McElhone, Stellan Skarsgård, and Sean Bean - a pretty fantastic cast. Also, the movie contains one of cinema's most unexpected plot twists: Sean Bean's character lives. 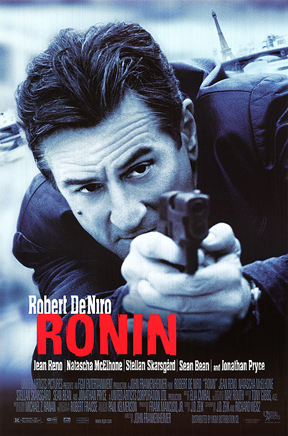 Ronin includes numerous other twists, as well, but they're more conventional. The team's betrayed from the inside, allegiances are strained, characters are killed... you get the idea. Considered objectively, the plot is impressively complex. That said, the complexity is somewhat wasted given that we're not emotionally invested. I was definitely left with the feeling the plot was better than it had to be. This only became an issue in the run time. The movie is more than two hours, which is a lot to hang on tone and action alone. I had one other problem with the movie, though it's a minor one. While most of it maintains a realistic tone, it falters in one or two aspects, utilizing 90's action tropes. First, there's the issue of collateral damage in the form of civilians getting gunned down with little consequence. If that many people were killed in Paris right on Christmas, the city would have been in lock-down. Second, the movie's otherwise amazing car chases are marred by a staple of the decade: jumps. Every time a car crests a hill, it sails into the air to illustrate how fast it's going. This, of course, is done with ramps, not reality. At the time, it would have felt odd to omit the trope; now, it breaks the illusion. All that said, the movie featured fantastic car chases, great acting, and wonderful atmosphere. It is, to the extent these things can be considered objectively, a very good film. Let's talk Christmas. The holiday elements are extremely thin. In fact, cut out one line of dialogue and a short scene, and there'd be no reason to think this was set anywhere near Christmas. But a few moments make it abundantly clear this is actually a Christmas movie. First, there's a brief "What do you want for Christmas" joke, along with a throwaway line about how the characters can't believe they're "working" on this day. All of this is right before they attack the convoy holding the case, an act that results in quite a few deaths (including several bystanders caught in the crossfire). That night, we see Sam navigate his way through a crowd of carolers, including a man dressed as Santa, while emergency vehicles go by in the background. Obviously, this is juxtaposition (the director more or less says as much in the commentary). No surprise here: that's probably the most common reason for setting these at Christmas. It's actually a bit unclear whether this sequence takes place on December 25th or a bit before. The line about it being inappropriate that they're working suggests it's Christmas Day, but not necessarily. Likewise, the celebration could have been on Christmas, on Christmas Eve, or a week before. It could even have displayed a Saint Nicholas Day celebration - it's never stated. Regardless, this occurs around the middle of the movie, and the rest plays out a few days before and after (since so much of the plot revolves around the immediacy of organizations trying to buy and/or steal the case as quickly as possible). Given our stated stance that anything set at the holidays is a holiday movie, Ronin passes on a technicality. Albeit a flimsy one.